The Player’s Grill is a beautiful public restaurant and bar located inside the clubhouse overlooking the NMSU Golf Course. Customers are treated to scenic views of the golf course and the Mesilla Valley while seated in either the restaurant or on the spacious outdoor patio. All golf course parking is free of charge and you don’t have to golf in order to dine at the restaurant. 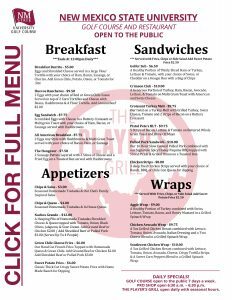 The Player’s Grill is open for breakfast, lunch and late-afternoon snacks Friday through Sunday and serves lunch and late-afternoon snacks Monday through Thursday. 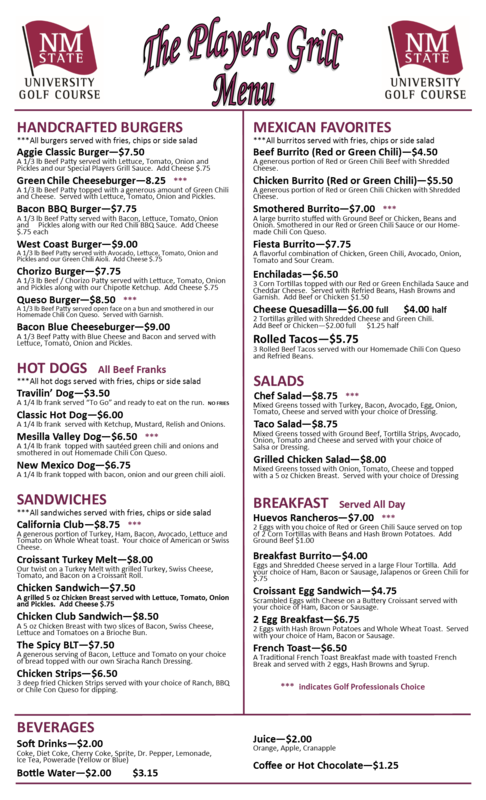 The menu offers a wide variety of items including gourmet hamburgers, hot dogs, pizza, sandwiches, salads, burritos and other Southwest favorites at affordable prices. The Player’s Grill also offers a full bar with a wide selection of domestic, imported and designer beers. The Player’s Grill is the perfect stop for a quick meal or just to relax after a round of golf or a hard day at work. NOTE: Hours of operation my vary during times of inclement weather.